Boy were our beavers ever right! They said it would be cold with plenty of snow. At first it seemed not so, but then winter caught up with us. It’s been cold and snowy ever since November! And we just got another six inches of snow with another eight forecast. Oh well, today it is 12 above so we are busy hauling hay to the horses and cattle. Will got stuck with the tractor so it took even longer than normal, but we got it done. 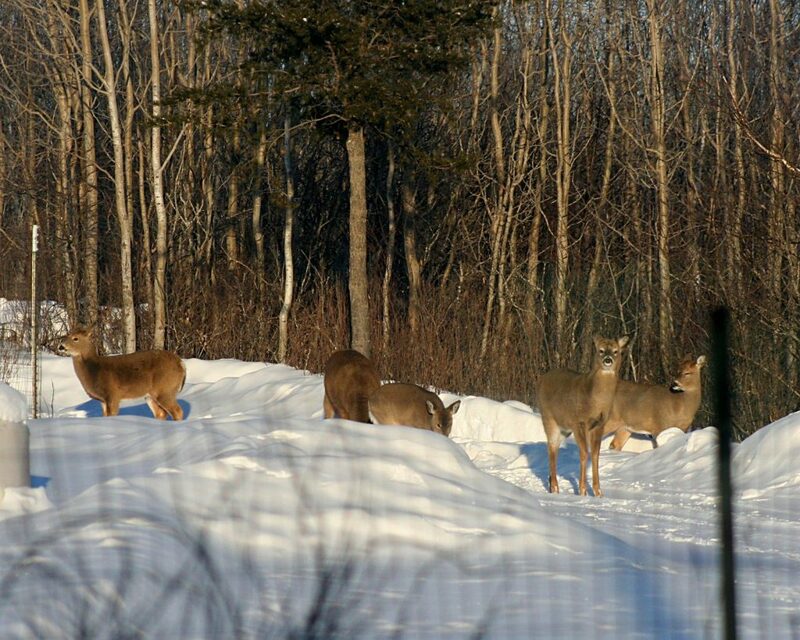 When I got back to the house, the deer were waiting in the driveway for me to bring their grain down into the pasture. You can set your watch by those deer! If I’m even fifteen minutes late, they start wandering up toward the house to see where I am. “Our” deer come up to the driveway if I’m even 15 minutes late to feed them their grain. Will’s been busy hauling big round bales to the horses and cattle plus plowing our long driveway as more snow arrives. 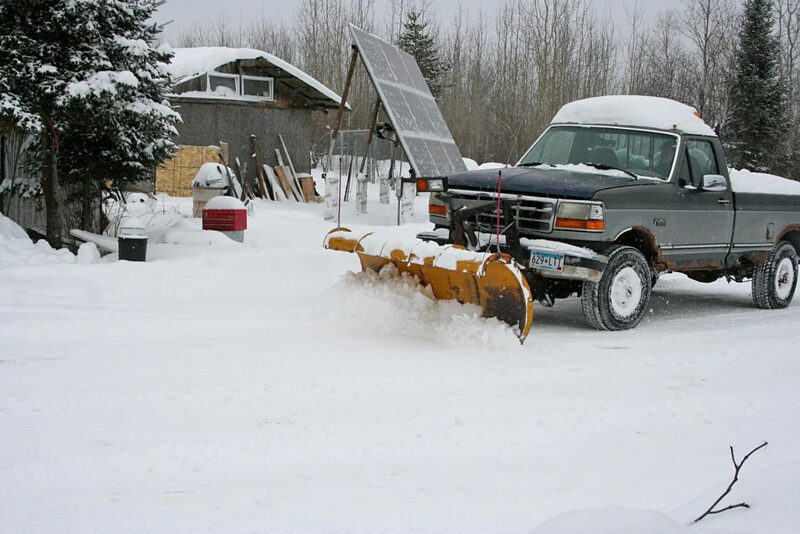 With all the snow, Will’s been busy plowing our mile and a half long driveway with the ’95 Ford truck. As it was getting pretty rusted out, we “retired” it from highway use and just use it for a plow truck. So far, the plowing is going nicely but soon the driveway will begin to get narrower as there is less and less room for the plowed snow to go. 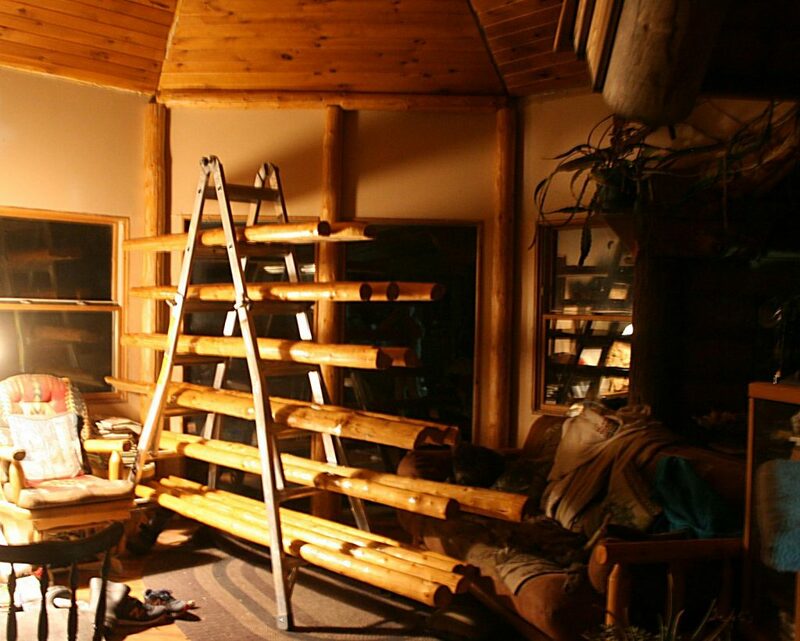 The log accent pieces are now ready to start fitting up onto the living room ceiling. Hey Pyro! So good you’re still with us. And Deb! Mia and John are doing fine but just got SNOW. Whew! The best thing about the seminars is all the new friends we make and keep!! I love it. Glad you got your catalog alright, Linna! And we’re real happy you like our seeds. Now if spring would just creep closer…. Jackie, I got a chuckle out of your deer neighbours showing up for dinner each day. It is funny how wild animals develop these routines with us. We think humans domesticated some animals but it makes me wonder just “who domesticated whom”. If I may share a story. When my cat passed away after 16 close, loving years together, I missed her so much that I took to feeding the squirrels that hung around the few trees in the front yard of my apartment building just for some companionship. Each morning before going to work, I would open the balcony door and toss a few handfuls of nuts over the lawn. A few of the squirrels became regulars and showed up each morning. One day when I opened the door, the large poplar tree right in front started shaking violently. I thought we had a wind storm until I realized that none of the other trees were moving. Then I saw two dozen squirrels, including a very pregnant one, all come scampering down the tree and line up in front of my balcony. I had to laugh at all of them standing on their hind legs staring up at me expectantly. I guess word got around amongst them. Squirrel telegraph! Wow. Same with our deer. Sometimes a bunch of “strangers” come along with the “regular” guys. Word does get around. Hi guys! John and I sure do miss you! Those accent pieces are going to look so beautiful! I’m glad Will has an inside project to work on. It’s been snowing and blustery here in California but, every time I start to grumble or complain about it think of you guys toughing it out in Minnesota!! So sorry to hear of your loss. I loved that line you shared from his obituary! What an inspiration! We miss you, too, Mia! So you’ve got snow, eh? Wow. Here I thought I’d fly to California and work on my tan! Lol! I loved that line too and really makes one think, doesn’t it? Are you all set to garden? Haha! Oh my gosh you guys are always welcome!! Maybe we should save tanning till July though…it’s 18 above tonight ! And yes! I just cleaned out the cold frame today. Oh my! I got so excited for spring. Came in the house and went through all my seeds. Expect an order from us soon!! Sorry about your friend passing. We are vacationing in Hawaii this year,away from the snow and ice. What grains are you feeding the deer? I think winter has finally arrived here as well. Have been enjoying unseasonably warm temps. Great for getting things done but we need to stop and realize that good comes from the cold. The freezing then thawing and heaving of the ground helps loosen it so we can work it. Also kills off bugs and pests that might otherwise be around all year. Best part is even though the work is harder to do it makes us slow down a bit. Gives us some extra time to relax and enjoy this life we have. Wow! Jackie you have some real deer buddies for sure! Awesome! They even come when I holler for them! I feel kind of dumb standing out there going “Here guys! Here kiddos!” But they come anyway. Gee, does that mean when I sit patiently on deer stand all I have to do is yell and that big buck will come running??? (No folks, I DON’T hunt “our” deer.) In fact because we’ve had so much beef lately, the deer rifle is gathering dust. Yes those deer are punctual!! We have 4 that come and if you are late they stare at the house! Kind of fun though! Sorry about your friend. Those older people are always missed since they have so much knowledge about everything! Just special people. In Montana, we had a couple that would come up on our raised deck and look at us in bed, through the French door if we’d sleep in. Boy what bosses! Dear Jackie, I really love you posts. Reading about the cold weather over there seems so odd when we’re having heat waves and no rain. I love the fact that you feed your local wildlife. We often have wallabies and wombats grazing here, we don’t mind sharing. Some local farmers see all other animals on their properties as pests. Very sad as the wild animals were here first. Sad news about your friend, he sounds like one of those with so much wisdom, a sad loss. Keep warm and spring will arrive in no time. Me? I’m looking forward to winter!! We do love our wild neighbors even though we do fence them out of our gardens. You said it right; they WERE here first! I’d love photos of your wallabies ad wombats! Gee, there must be a way to get them posted here so everyone can see them. I’ll ask. I’m sure it is quite a task to plow your driveway. I remember missing the big green mailbox and missing the road to your place. The trip back in was an experience. My hat’s off to you. I grumble at times about a 3/10 mile driveway and the barnyard area to clear off. We had the great melt down and now very little snow on the ground. Temps now here in the 20’s with freezing rain, I would prefer the snow. Stay warm/stay safe. I love the note on the passing of your neighbor. As I (and family) have become part of this place (40years) we suffer the loss of people who have been dear to us. Spring will come. It’s really not so bad, plowing out and in, as long as the plow truck starts and the plow’s motor isn’t frozen up so the plow won’t go up. Will carries a propane torch in the cab, just in case! Yep, I’d sure rather have snow than freezing rain. It’s so hard on everyone, especially the livestock. And I hate the ice! Thank God, Spring will come!